Whispers in the Loggia: The Dream, "Well and Alive"
The Dream, "Well and Alive"
Behind the scenes at last month's November meeting, one well-regarded Louisiana prelate didn't need much (OK, any) prodding to praise the state's wunderkind Republican governor -- Bobby Jindal, a convert from Hinduism widely mentioned as a 2012 ticket-topper -- to the heavens. And, now, said dear bishop likely finds himself with even more to love. 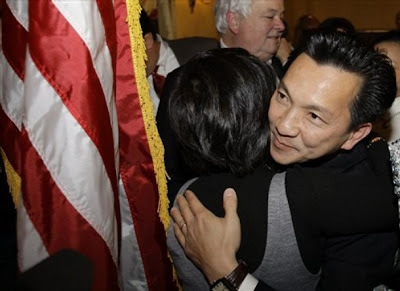 In a runoff yesterday, a heavily-African American, two-thirds Democratic New Orleans district made history by electing Republican Anh "Joseph" Cao, an immigration lawyer, as the nation's first-ever member of Congress from the Vietnamese community. Born in Saigon (now Ho Chi Minh City) and emigrated to these shores before his 10th birthday, the 41 year-old Rep.-elect unseated William Jefferson, a nine-term incumbent laid low by high-profile public corruption charges. Oh, and Cao -- now married and a father of two -- spent several years as a Jesuit novice before leaving the Society... and served from 2003-07 on the Stateside church's top lay body, the USCCB's National Advisory Council, by appointment of the Crescent City's Archbishop Alfred Hughes. Cao made direct reference to his improbable political ascent, seeming as astonished as anyone else. "Never in my life did I think I could be a future congressman," he said. "The American dream is well and alive." Though he was a relative unknown before this race, Cao was flanked Saturday night by a number of local political power brokers. U.S. Rep. Steve Scalise, a Republican from Metairie, introduced him to screaming supporters. City Councilwomen Jackie Clarkson and Stacy Head, both Democrats, were in attendance, along with former TV news anchor Helena Moreno, who was defeated by Jefferson in the Democratic Party runoff. Several GOP party leaders, including former City Councilmen Jay Batt and Bryan Wagner, also joined the crowd. At Cao's side was his wheelchair-bound father, who spent seven years in a North Vietnamese prison camp during that country's civil war. In his closing, Cao offered thanks to the local immigrant community, and he made a special plea for peace in the country of his birth. Cao maintained a generally cordial tone during the campaign, limiting his criticism of Jefferson to questions about the congressman's effectiveness and ethics and rarely mentioning the criminal charges. However, as election day neared, the National Republican Congressional Committee stepped in with a series of harsh mail pieces and an automated telephone call to voters that highlighted the allegations of money laundering, racketeering and bribery and labeled Jefferson as "crooked." Organizers of Cao's campaign denied having a hand in the attack. An influential hotspot of the Vietnamese diaspora -- the nation's first bishop from the community, Orange auxiliary Dominic Mai Luong, was once Cao's pastor -- media trailed the congressman-elect earlier today as he and his family attended Mass at New Orleans' Vietnamese church, Mary Queen of Vietnam, their home parish. Along with the rest of the 111th Congress, Cao will be sworn in on 6 January.